©2018 Aaptiv, Inc. (P)2018 Aaptiv, Inc. Overall, this is the best guided meditation I've listened to. The music is soothing, and isn't distracting. The narrator is calm, and provides understandable and usable guidance. However, the introduction on the first track should be a separate track. It is extremely distracting, and pulls you away from a meditative state. The outros are even worse. If I've actually achieved a meditative state, the last thing I want is a wake up, slowly raising the volume levels and telling me I've "completed" my session. Just gradually fade out, and let me decide when I'm ready to revisit reality. These are some major flaws, but they should be easy to fix. This was non relaxing. The voice is too harsh, too fast. There is no feel of synchronicity or connection. Although these were free of charge, they will be dated from my player. It feels like you are in a gym session, getting fired up and ready to go hard. This is not my idea of relaxation. This is the first time I stick to a guided meditation, it has different objectives which make it interesting. I'm on day 17 and I love how it is now going into the chakra points. Impossible to sleep or relax with this rushed and stress driven recording. Just really bad. This was very interesting and beneficial. 21 days of different kinds of meditations. Definitely learned a lot. So far, I just listened to day one. Jess has a nice, pleasant, comforting voice and her instruction is very good! But, the so-called background music is irritating. When it comes to meditating, silence is a good thing! Can remove it. I purchase this and am enjoying it but I'd direct you to purchase elsewhere. 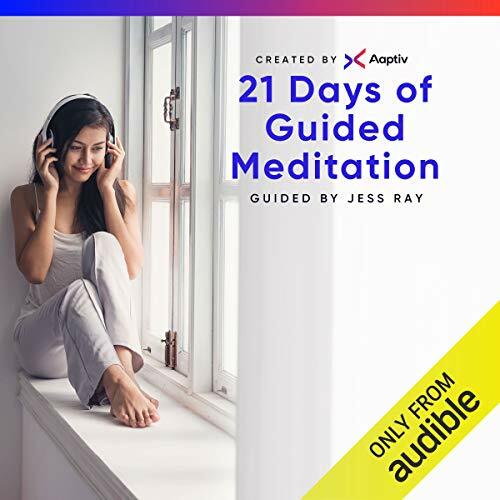 Higher rated guided meditations that you can actually own. I have one series I've used six years. They pull this from your library in September. The speed and energy in which the speaker spoke was relaxing and helped focus on the intent of the meditation. 6 months ago, tragedy struck our family. As a result, my husband and I ended up with our two teenage and one pre-teen granddaughters moving in with us. Of course we are involved in counseling and practicing our Christian Faith. But recently, I decided to introduce the girls to this Aaptive 21 days of meditation series. Every morning, we get up 15 minutes early and make ourselves comfortable in the living room. We put Jess on and walk through the a 10 minute guided meditation. Starting our day like this has made a tremendous impact to our lives. The level of stress has de-escalated, and although it’s not gone entirely— we are all noticeably more calm. This calm is with us in our day and in the way we communicate with one another. Jess’s voice and delivery are perfect. I like her so much, I don’t want to listen to anyone else! The girls actually request to do her meditations. Jess is so calm and lovely to listen to. I highly recommend 21 days of meditation.